THIEVES KNOW THEY CAN REMOVE THE HINGE PINS IN SECONDS! Deter Thieves from Breaking In! Interior doors, inter office, computer room, records rooms. Schools, interior and exterior doors, classroom doors, record rooms. Huricane zones in Florida needing out-swinging doors. 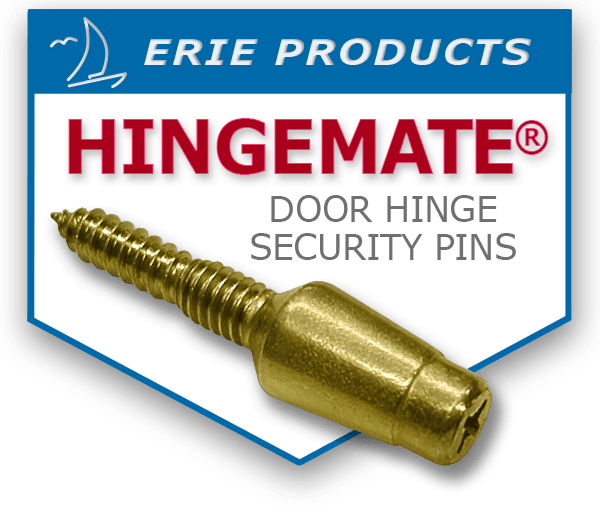 Hingemate™ door hinge security pins are easily installed with basic tools on both wood and steel doors. Each Hingemate™ door security kit includes three Hingemate™ pins and installation instructions. Bulk cases of 50 pins available. Life Safety Codes require that entrance doors on commercial, industrial and institutional buildings swing outward. Because of this, their hinges are mounted with the hinge pins exposed to the outside. 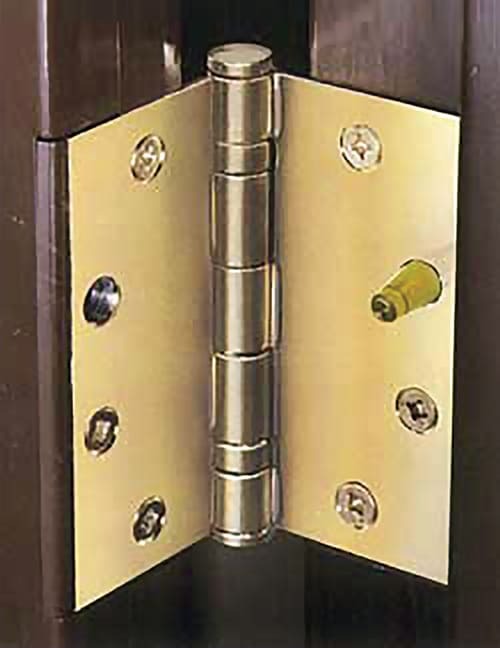 These exposed pins can be removed and replaced in only seconds by thieves or vandals. Entry and exit can be made quietly, with no effort and no criminal tools. How will you explain the property loss to your insurance company when there is no sign of forced entry? With this in mind, Erie Products LLC developed the Hingemate™ passive deadbolt protector system. The passive security and safety provided by the Hingemate™ is worth a thousand times its cost. By taking a few minutes to install the Hingemate™, you can insure your property with a lifetime of security. please mail printed ORDER FORM to Erie Products LLC. ©2018 Erie Products: Distributor of High Quality Consumer and Corporate products.